LOW INTRODUCTORY PRICE. ALL 7 WHEELS ROTATE 360 DEGREE SO THAT THE CHILD CAN EASILY MOVE AROUND EVEN ON HEAVIEST CARPETS. EASY FOLDING. DETACHABLE AND WASHABLE SEAT. DETACHABLE MUSIC PANEL. 7 DOUBLE WHEELS TO EASY MOVE AROUND. LOW INTRODUCTORY PRICE. New pink Baby walker. ALL 7 WHEELS ROTATE 360 DEGREE SO THAT THE CHILD CAN EASILY MOVE AROUND EVEN ON HEAVIEST CARPETS. EASY FOLDING. DETACHABLE AND WASHABLE SEAT. DETACHABLE MUSIC PANEL. Easy folding, folds flat. 360 Degree Rotating plastic wheels. Detachable Music Panel. 2 Spinning Face Jokers. Available in 4 Bright Colours. Lightweight & easy to move around. Detachable and Washable Seat. With textured wheels, an easy grip handle, and a durable design, the sturdy walker gives all the support they need to take their first steps. The fun-filled activity panel can also be removed from the walker for extra sit-down play. With lots of exciting activities, cheerful music, and friendly phrases, little ones will be introduced to numbers, shapes, animals, and colours Features: 4 In 1 Multi Functional Baby Musical Play / Feed Station & Push Walker AGE: 4 Months Function 1 :Play Station: Sit on the floor and play ( Front Wheels Folded ) Function 2: Baby Sit inside as feeding station ( Front Wheels Folded ). Easy folding, fold flat. 360 Degree rotating plastic wheels. Lightweight & easy to move around. Toy tray required 2 AAA batteries ( not included ). Detachable music panel. Good used condition from a Smoke and pet free home. thanks for looking. Collection from Ls7. Hauck Ride On 123, 3 In 1 Baby Walker Ride Toy - Hearts, Grey. Condition is New. Ride On/Push Along baby walker. Help them learn to walk the fun way. Comes with music/sounds, a storage compartment and a play telephone. Walker and Ride-on! Easy grip handles Lights and sounds Activity board Assembled Product Dimensions (in centimetres): 22 (h) x 41 (w) cm Battery Details: 3 x AA It’s easy to assemble and removing the legs from the walker and tightening them into place for the ‘ride on’ requires no tools (or screws) at all. The front panel is quite basic but additional features make the product more interesting – songs, lights, toys – although the plastic phone does not attach well and is easily lost. Classic World - Rider and Walker. They last forever. They are passed down through the generations. Classic World wooden toys support such imaginative play. As Einstein said“Imagination is everything. 2 or 3 Piece Nursery Room Sets(4 or 6 Boxes). Back Carrier/Baby Carrier/Accessories. Number 5332212. The right to cancel is a no fault cancellation. If the goods are faulty then the standard statutory rights apply. Baby walker red formula 1, used. Really good condition. The steering column is fully functioning so steering the car is childs play. 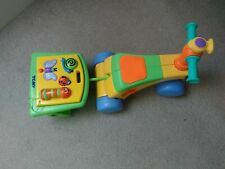 Little ones will love this shiny white Goki ride on racing car with flower details, pink number 1 and pink wheel trims. Suitable for ages 1-3 years old. Vintage Mulholland & Bailie Husky Dog Ride On Walker. In good vintage condition. Large 23" tall by 22" long. Ride on with wooden foot rests. Collection in person only. 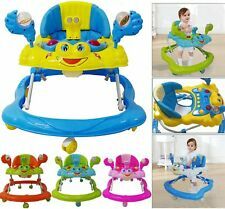 Baby Walker Activity Musical Toy Push Along Ride. Easy folding, folds flat. 360 Degree Rotating plastic wheels. Detachable and Washable Seat. Detachable Music Panel. 2 Spinning Face Jokers. Material: ABS Plastic.